announced the outcomes of Playing Australia Round 25. Playing Australia is the Australian Government's national performing arts touring program, which gives Australians across the country the opportunity to see some of our best performing arts. One of the winners of this prestigious program is the Sensitive New Age Cowpersons who will have a series of national tours coordinated for them by Country Arts WA. The Sensitive New Age Cowpersons are set to make tracks from December this year into 2006. The Cowpersons will tour around Australia and will play a total of 28 venues in New South Wales, South Australia, Victoria, Queensland and Western Australia. "We're very excited and honoured to be on these tours. 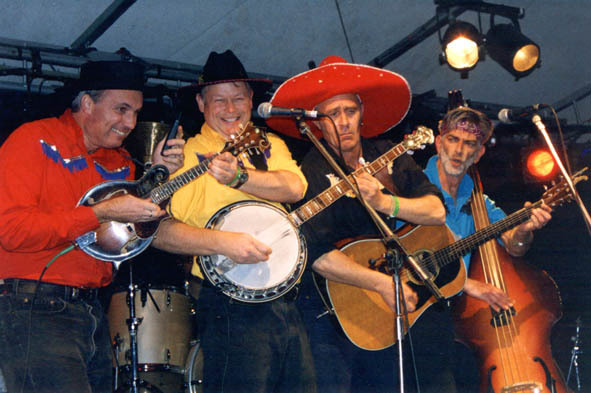 The boys are all looking forward to playing in parts of Australia we haven't been to before, meeting lots of new people and hopefully giving our audiences a great night out," said Cowpersons front man, "Calamity" Jim Fisher. "As the SNACs are from Western Australia, we would never be able to have them here without assistance from Playing Australia. Because of the unique nature of the SNACs, their visit will diversify the experiences for our audiences," said Charles Parkinson of the Hothouse Theatre in Wodonga.